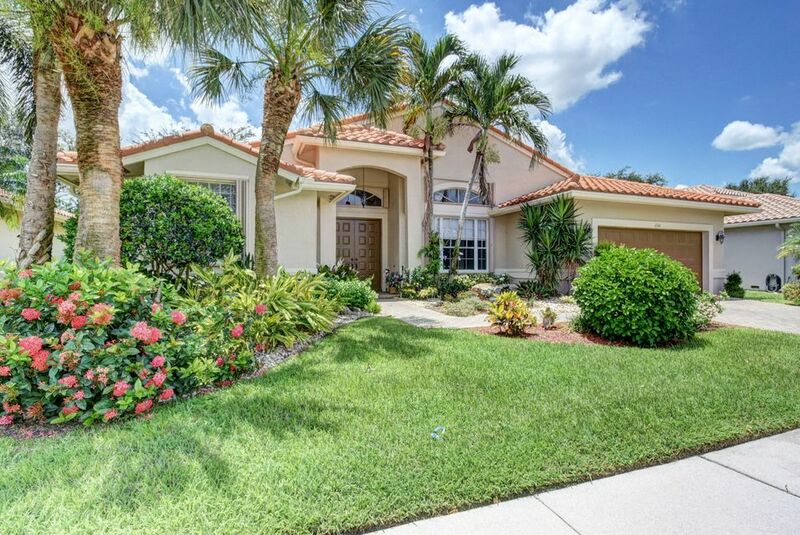 Beautiful CUSTOM expanded Eaton model w/pool & golf & lake view. Home is loaded w/extras. From the double doors with a unique marble tile entry & decorative pillars. To the main area tiled w/neutral 20'' tile on the diagonal in main living areas. Dining room has decorative pillars, custom mirrors & over-sized window to bring in more light. Living Room has a custom bar with granite counter, great for entertaining. Separate guest suite with 2 bedrooms & a bath with a pocket door for privacy. Family Room is extended, with decorator fan, views of pool with waterfall, golf & water through multiple sliding glass doors. Kitchen has custom 42''wood cabinets, crown molding & some glass door cabinets. Counter tops & full back splash are granite. Master Bedroom has private double door entry.